Here at WIRS we offer a wide range of products in this category such as	3M™ Silver Cutt Off Wheels, 3M™ Depressed Centre Grinding Wheels and 4560 siabite etc, everything for your welding needs. Below is some of our best sellers for our Abrasives / Grinding / Sanding / Cutting / Discs category, many others available so please contact us with your query. PN51785 - 115mm - just £1.20 each! PN51790 - 125mm - just £1.43 each! 3M™ Silver Depressed Centre Grinding Wheel is our type 27 wheel, designed to deliver an unbeatable combination of performance and value that delivers a fast and consistent cut during grinding and heavy stock removal on stainless steel, mild steel, aerospace alloys and more. PN51748 - 125mm - just £2.35 each! PN51747 - 115mm - just £2.24 each! 4560 siabite's coarser grits have been designed for high stock removal on mild steel. The disc also delivers consistent surface quality in finer grits on stainless steel. All this leads to faster completion of your grinding applications. The 4570 siabite X from sia has the coolest grinding with the new X-Technology. The discs have longer lifetime as the X-Technology leaves more space between the grain, maximising the total working life of the grain and the disc. It has cool grinding as the X-Technology applies the cooling aid directly on the grain surface, making it more active during the grinding process, helping to displace heat build-up quicker. The X-Technology always allows the grain structure to fracture more easily, maintaining a sharp cut throughout the disc lifetime. The new siaramic grain has been specially developed and produced by sia Abrasives to provide the fastest stock removal, the most consistent cut and the maximum lifetime possible. The optimal triangular shape of the siaramic grain allows a clean cut for the fastest removal and thus makes the disc faster than any conventional ceramic grain on the market! Your ideal choice for carbon and mild steel - offering a faster cut and longer life than aluminium zirconia (AZ) and conventional ceramic abrasives. These discs also require less grinding pressure for easier operation. Optimised for stainless steel and non-ferrous metals like aluminium and titanium. Cuts cooler, faster and lasts longer than conventional ceramic discs in applications like weld removal, beveling, edge chamfering and more. Sia Sanding Discs are available in a variety of grits from all three of our branches in the UK. These abrasives have been developed with the consumer in mind as they can be manufactured to suit almost equipment. Ranging from single sheets or rolls all the way up to specifically designed components for machinery Equipment. Sia Sanding Discs have been manufactured in Frauenfeld Switzerland for well over 100 years and Sia currently ranks in the top three suppliers of abrasives worldwide. They develop, manufacture and market complete abrasive solutions including Sia Sanding Discs for a variety of different professional applications. Nearly 135 years of expertise has gone into producing Sia Sanding discs and WIRS are more than happy to help guide you through our abrasive supplies to find the solution best for you. If SIA Sanding Discs are what you are looking for then call WIRS as we distribute a vast collection of SIA abrasives and other welding supplies to the West Midlands from any one of our three branches. Sia Sanding Discs also have a wide range of applications with flap discs, fibre discs, linishing discs and ceramic discs. Call WIRS today and we’ll help choose your best abrasive disc for your needs. 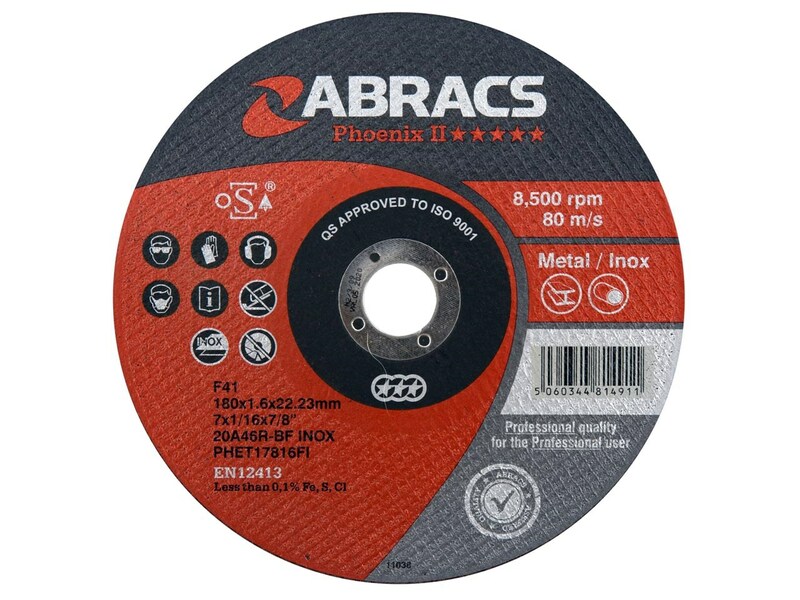 We have a wide range of cutting disc including the Abracs Phoenix 2. Abracs's Phoenix II Cutting are a popular abrasive due to their superior quality. Phoenix II abrasives are a European manufactured range of discs and are perfect for cutting stone and cutting metal. Phoenix II discs are produced to O.S.A. safety standards and marked with EN12413. Manufactured using premium quality materials, Phoenix II discs offer professional performance, long life and excellent value. Range of top quality, European manufactured range of cutting and grinding discs for both Metal and Stone. Depressed Centre, suitable for a range of grinding applications. Designed for use with 115mm angle grinders. "Has been known to last 13x longer than competitors products"